Deciding what defines the best scope for an M&P 15-22 depends greatly on where you plan to put this versatile rifle to use. This Ar-15 imitator chambered in .22 long-rifle benefits greatly from a red-dot sight in particular when fired at close range while training and casually plinking. Elsewhere, a variable scope drastically elevates its accuracy for long-distance and precision shooting. The most important factor is to remember that it needs to be scoped appropriately for its true caliber, a .22 long-rifle, and not a standard .223 calibration. 6 Related Video: Should You Buy a M&P 15-22? Nikon P-RIMFIRE BDC 150 Rifle Scope. For the P-RIMFIRE BDC 150, Nikon chose Eco-Glass lenses finished with several coats of anti-reflective compounds to ensure that the lead and arsenic-free material absolutely retains the brand’s signature consistent clarity. I wasn’t the least bit disappointed. The picture was perfect with a clear reticle, thin lines, and an easy-to-see crosshair. Vortex Optics SPR-1301 Spitfire 1x Prism Scope. The more optics I test and review, the more I accept that Vortex has earned a place of honor alongside Leupold and Bushnell for exceptional visual quality within almost any price range. I would present anyone with this scope in particular to demonstrate the all-important difference in clarity that full multi-coating can make, along with foolproof moisture-proofing by nitrogen purge with an impenetrable O-ring seal keeping dust and debris at bay. I love that the Spitfire also offers a choice of red or green reticle based on the shooter’s preference. Some simply see one color more clearly than its opposite, so this is a most thoughtful consideration. The solid clicks of the brightness adjustment made it satisfyingly easy switching between a 3 for ideal indoor shooting and a 5 for perfect visibility outdoors. I did find it curious that there isn’t much difference between 3 and 4 but a massive jump at 5, though that’s more of a curiosity than a functional deal-breaker. Leupold 115388 Mark AR MOD 1 Rifle Scope. It is next to impossible to pick against Leupold in this category, regardless of a scope’s intended application. From their lowest-priced optics to their Cadillac-class scopes, their glass isn’t known for being overly treated. Yet, even when stacked up against such notoriously clarity-obsessed brands as Bushnell and Swarovski, the quality is peerless. Their second-generation argon and krypton purging and interior O-ring sealing against moisture makes a fogged or watery tube unthinkable. The optional daylight-visible GreenFire illumination adds a stunning tactical touch to already flawless materials for visual quality made to endure as long as your gun itself. 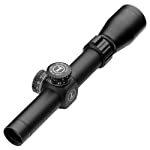 Leupold 115388 Mark AR MOD 1 Rifle Scope. Leupold scopes are easily as tough as they are precise. The aluminum-polymer body doesn’t feel like it should be nearly as rugged as it is, but take my word for it, this is no shrinking violet. I never fail to fall in love with the elegant simplicity of its European design married with enduring American pride in quality craftsmanship. Nikon P-RIMFIRE BDC 150 Rifle Scope. Nikon scopes strike such a fine balance between their aluminum-polymer bodies being appealingly light and still able to withstand at least a moderate beating. Considering the M&P 15-22 popularity in particularly active settings prone to plenty of movement, that’s certainly a welcome notion. Even if I were to trip myself up and send my rifle crashing, I would feel reasonably confident in its ability to hold its zero and go about business as usual after I dust myself off. Vortex Optics SPR-1301 Spitfire 1x Prism Scope. The bad news is, the Spitfire’s fine and complex engineering prohibits Vortex’s signature one-piece housing. Here’s the good news: this scope every bit lives up to the manufacturer’s reputation for solid construction that feels like it could survive making landfall from orbit. Vortex doesn’t exactly settle for less than aircraft-grade aluminum and this compact devil can take some knocking-around without showing a crack. With few exceptions, Vortex scopes are as sturdy as Leupold glass is tequila-clear. The Spitfire also comes with Vortex’s acclaimed VIP warranty coverage, but their optics in general rarely require it. Vortex Optics SPR-1301 Spitfire 1x Prism Scope. This is a bit awkward: being a red-dot scope, I really cannot say much about the Spitfire. It sells itself with its remarkably well-defined reticle and illumination, not its ability to bring a shooter up-close and personal with a target. In fact, my one comment isn’t exactly positive: its name is a bit of a misnomer. What little magnification it offers is more of a 1.5x than a true 1x. Nikon P-RIMFIRE BDC 150 Rifle Scope. When it comes to rifles such as the M&P 15-22, I tend to believe that fast sighting and a crisp, defined reticle matter far more than magnification. That being said, the P-RIMFIRE BDC 150 shines at longer distances when cranked up to 3, making it a perfectly versatile choice. I also came away quite pleased with the comfortable eye relief it afforded me when paired P-Series mounting rings. Leupold 115388 Mark AR MOD 1 Rifle Scope. It was close, but I give this nod to Leupold based on how its already-perfect glass performs with the 20mm objective’s limited 1.5-4x magnification. As I expected, not an ounce of detail was lost as I zoomed in and drew down on a 200-yard target as cleanly as though it were only 50 yards out. At 1.5x, my most rapid shots in close quarters felt perfectly comfortable and hit home as though guided by a laser. Nikon P-RIMFIRE BDC 150 Rifle Scope. The aptly named BDC 150 reticle is a bit of a godsend for the P-RIMFIRE. It calculates bullet-drop compensation with surgical precision for perfect holds with minimal guesswork required. The result? Consistent ¼-inch groups at 50 yards with the target turrets’ smooth hand-turn adjustments. The holdover circles are spot-on at their designated distances. That kind of performance does indeed make up for some annoying parallax at 25 yards. Vortex Optics SPR-1301 Spitfire 1x Prism Scope. As with the Nikon, it’s unfortunate that one of the Spitfire’s finer points has to make up for areas where what should be a selling point disappointed me. The Dual Ring Tactical (DRT) reticle etched in the glass facilitates blistering-fast targeting with a constant point-of-aim. Given how inconsistent the brightness of the illuminated sight can be and the somewhat brief 250 hours of battery life, you might almost wonder why you bother turning it on at all instead of simply using the permanent sight. I know I did. Nevertheless, there’s no discounting just how dialed-in this scope is, despite a sight picture that gets somewhat fuzzy past 100 yards. Leupold 115388 Mark AR MOD 1 Rifle Scope. From adjustments measured in Mil-clicks equal to roughly ⅓ inch each – slightly finer than the average 1-4x scope, I might add – and made with meticulously calibrated elevation and windage turrets to its stubborn hold on its zero, you won’t find many more accurate scopes than this wonderful little Leupold. The worst I can say is, it could do with a bit more eye relief. Otherwise, you will have no trouble working this all the way up to an 800-yard setting with enough persistence and resetting to your previous benchmark without missing a beat. Leupold makes the best scope for an M&P 15-22 not because it comes loaded down with “features” but because it melds uncompromisingly simple design with some of the world’s highest-quality materials. For all the bullet points that would rightfully sell anyone on the Vortex or Nikon, Leupold is just naturally superior in a way that you have to shoot to understand. Related Video: Should You Buy a M&P 15-22?